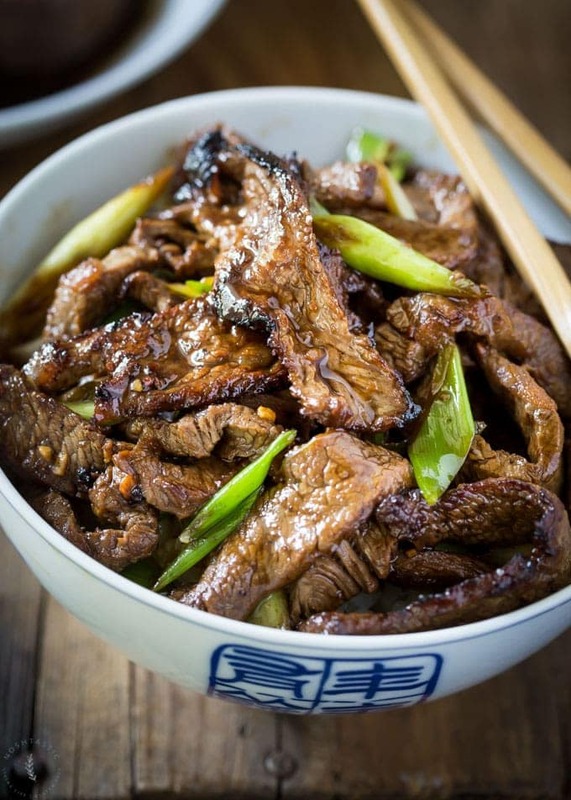 My Keto Low Carb Mongolian Beef is a healthy remake of the PF Chang’s classic take out! The regular recipe is often loaded with sugar, but this healthy low carb version has no added sugar but still tastes really delicious, is naturally sweet, and my kids loved it way more than the classic version. I used coconut aminos instead of gluten free soy sauce as it’s naturally much sweeter tasting because of the coconut but has no added sugars. 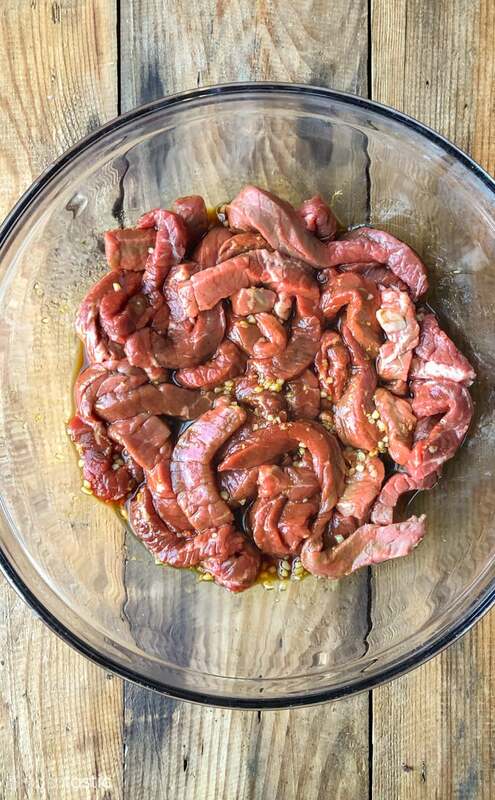 And the net carb count for my keto Mongolian Beef is pretty great at around 4g per serving with this recipe, serving four people. Although if you have hungry teenagers like I do you may want to double the recipe! Then measure out your coconut aminos for the marinade. 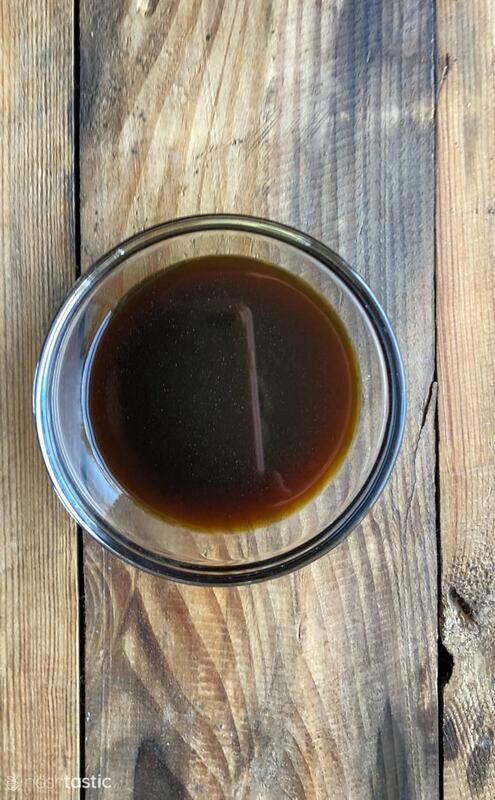 You could use gluten free soy sauce instead, however coconut aminos are naturally sweet in a way that gluten free soy sauce is not so you will lose that sweetness in the recipe if you substitute them as we are not adding any sugar. It will also be a lot saltier so you will probably need less soy sauce if you go that route. Next, finely chop the garlic and grate the ginger. Both of these will be added to the coconut aminos to create the marinade for your keto Mongolian Beef. I use this mircoplane tool to grate the ginger, it’s much easier than chopping it with a knife. 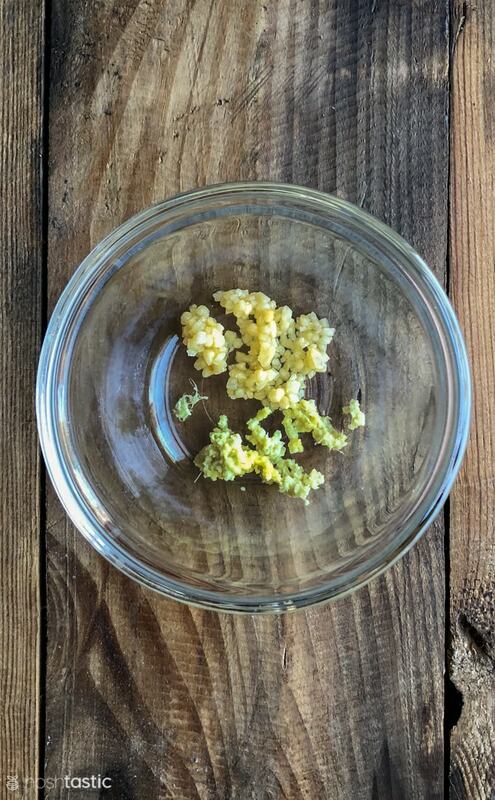 Add the garlic and grated ginger to the coconut aminos marinade and mix well together. Then we’re going to add it to the already sliced meat. Then you can either add it to a ziplock bag along with the sliced meat, or you can put it all in a bowl like I have it in the photo above. You need to let it marinade for at least one hour in the fridge before it’s ready to cook. While the meat for the keto Mongolian beef is marinating in the fridge you can cut the green onions. 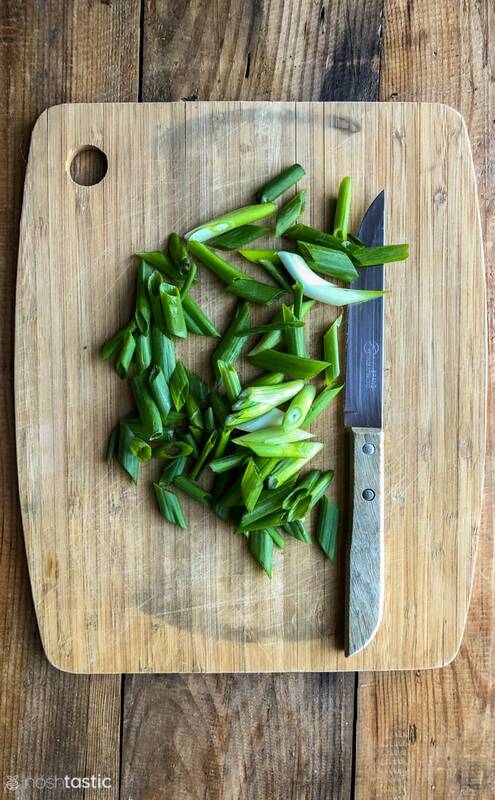 You can chop and slice them any way you like, but cutting them on the diagonal makes for a pretty presentation. When you are ready to cook you can remove the beef from the fridge and drain off the excess liquid, but don’t discard the liquid as we’ll add it back to the recipe at the end. Get your large skillet or wok really hot and add the oil, if the oil is not hot enough you won’t get the nice crispy edges on the meat. Then add the meat to the very hot skillet taking care not to add too much or it will steam the meat if the skillet is too full, so you may need to cook in a couple of batches depending on the size of your skillet. You only need to cook the meat for your low carb Mongolian Beef for about 1-3 minutes or so, it cooks very fast. You’ll also need to watch that you don’t burn it when you have the skillet on a high heat. Then when the meat is almost finished cooking you can add the green onions and cook them briefly for about 30 seconds to a minute or so. I also like to add the remaining sauce at this point along with the onions and let it reduce while the onions are cooking. My top tip is to start with the right cut of meat! Flat Iron steak or Flank Steak are my favorite cuts of beef for this recipe.Sirloin steak works too in a pinch, but the other cuts are better in my opinion and are much more likely to give you that nice crispy edge on the slices of meat. 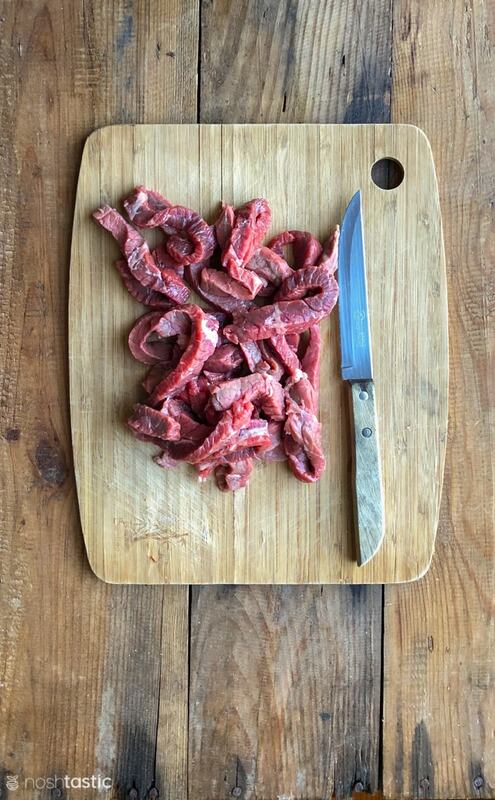 Always make sure you slice the beef very thin, and against the grain for best results. This will not only help the meat absorb the marinade, but it will ensure it cooks very quickly too. I recommend seeking out coconut aminos for this recipe as opposed to using gluten free soy sauce. 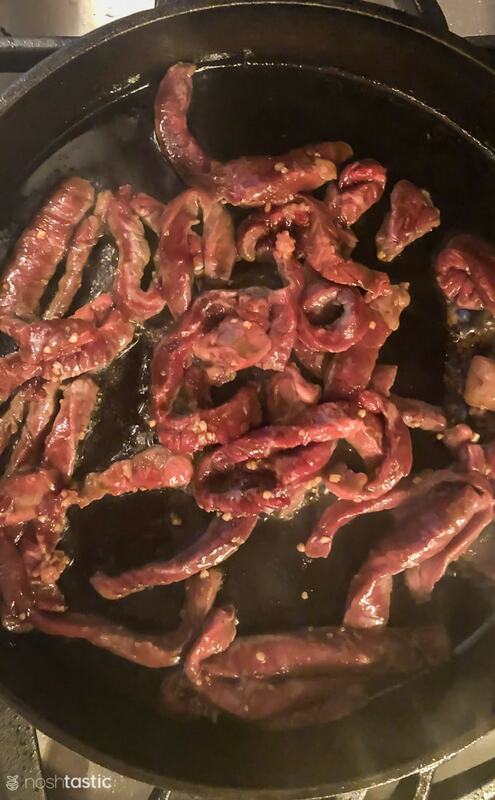 As I mentioned above we are not adding any additional sugar or sugar substitute here and the regular Mongolian Beef recipe is traditionally very sweet so this helps to get that sweet flavor we love, but without the carbs. I have tried it by adding low carb sugar substitute but the flavors were not pleasant, so in my opinion the coconut aminos are a better option. Although most of the recipes you’ll see online for Mongolian beef typically have a lot of starch added to make a thick sauce, if you have ever eaten the recipe at PF Chang’s you’d notice that it’s actually not cooked with a thickened sauce, so I like to think that my version is closer to the real thing! Do remember to drain the meat from the marinade before you fry it. 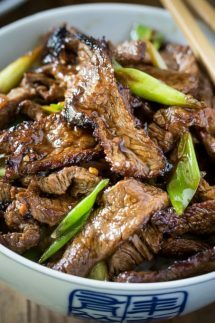 This will help you get the deliciously crispy edges on your meat that the famous PF Chang’s Mongolian Beef is known for! And lastly, the second tip for getting those great crispy edges is to have your oil really hot before you add the meat, preferably in a wok, but a cast iron skillet will work too. WATCH MY VIDEO OF KETO MONGOLIAN BEEF! This is a great short step by step video of this recipe! I think a recipe video always helps so if you agree go ahead and subscribe to my youtube channel and stay tuned for more low carb recipes coming your way soon! 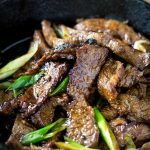 Keto Low Carb Mongolian beef recipe that's so delicious you won't miss the sugar! It may be helpful to watch the recipe video first, it's right above the recipe card. Add the sliced beef to a small ziplock bag and add the coconut aminos, ginger, and garlic. Let marinate for 1 hour in the fridge. When you are ready to cook, drain the meat from the marinade but reserve the liquid for later. Add the coconut oil to a large wok or cast iron skillet and heat it until it's almost smoking, the oil must be hot so you can get the nice crispy edges on the beef. Add the beef to the very hot oil (you may need to do it in two batches, don't crowd the pan) and keep stir frying over a high heat, taking care not to burn it for just 1-3 minutes. When the last batch of meat is in, add the green onions and cook for the last 30 seconds to 1 minute. 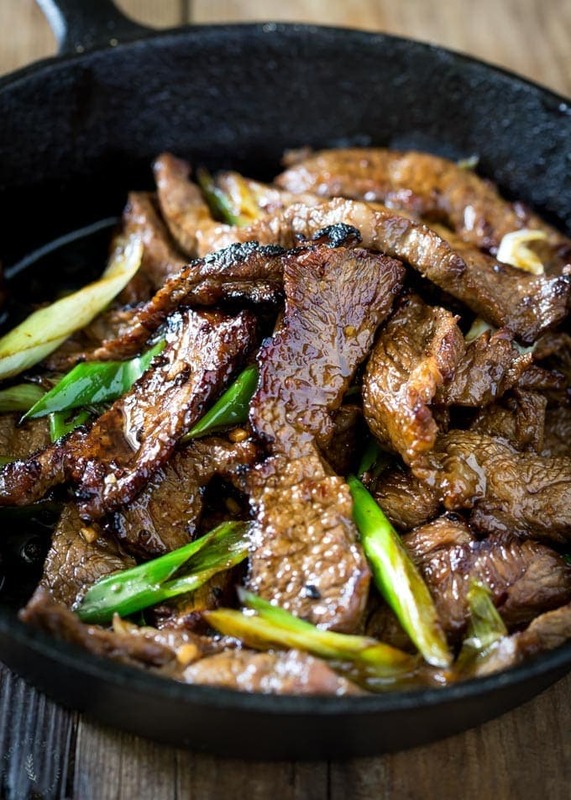 If you want more 'sauce' to serve with the meat quickly cook the remaining marinade for just a minute or two in your wok after the last batch of beef has been cooked, and serve with the beef. This recipe has approximately 4g net carbs per serving. Some coconut amino brands have a higher carb count than others depending on the ingredients so read the label. I like Coconut Secret or the Kroger brand. 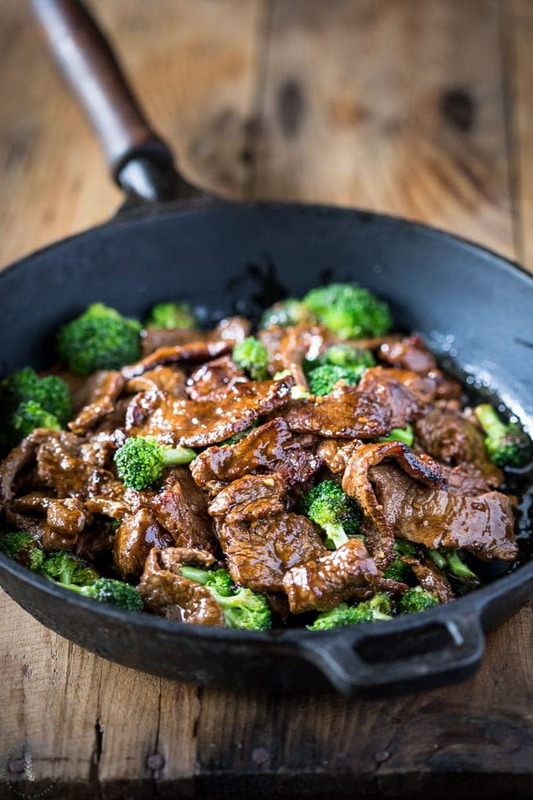 I’ve been looking for a low carb Mongolian Beef for a while that was close to the real deal but without all the sugar and starch, this was great! For anyone else making it, you really do have to have a very hot pan (and thin cut meat) to get the beef to cook like it shows in the photos, other than that it’s a great recipe and I’ll be making it again. This is a very simple recipe but I’m so pleased it worked well for you! Yes, a hot skillet is a must to get those crispy edges on the meat! Just made this recipe, it was very flavorful! The only thing was the oil splatter from it being so hott. How do you all keep that part under controI? any advice for my next go round? I used a high sided wok so that helped a bit, but yes it can create a bit of oil splatter. 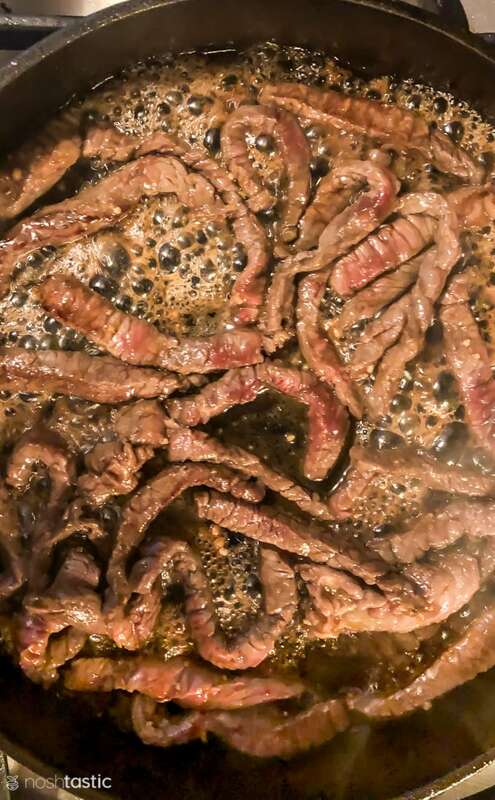 You can turn down the heat, but then you don’t get such crispy beef. We made this tonight and it was super tasty, I love the slight sweet flavor of the coconut aminos and we did not miss the sugar at all, thanks again! 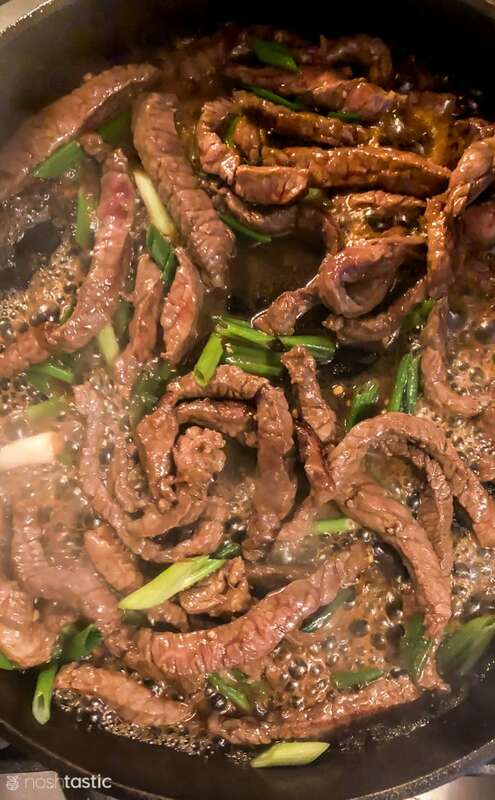 We love the mongolian beef too, I’m glad you like it! Hi Wendy, Cauliflower rice is always a good option, I’d just add a little salt pepper and maybe some garlic powder to it for this recipe (I have several cauliflower rice recipes in my recipe index if you need to know how to cook it) or I love either green beans or broccoli with this, I hope that helps! Hi Gina, it might have been the brand of coconut aminos, the brand I’ve used is not super salty. Or yes, it could be that you didn’t need quite as much marinade even though you doubled the meat. This recipe looks amazing! I will point out that I do think you have the net carb count incorrect. Coconut Secret Aminos has 1 carb / tsp (not Tbsp! ), so the 1/4 cup called for in this recipe would equal 12 net carbs, not 4! you are correct that it’s 12g net carbs per 1/4 cup of coconut secret coconut aminos. However, that is for the total amount used and the macros listed are per serving with four servings per recipe, so that’s why it comes out at around 4g net carbs per person. It never says what or how much is in a serving…. This amazes me because you are not regular on how much to eat or how many serving. It has 4 servings listed at the top of the recipe next to cook time,prep time and so on. with 1lb of beef total per recipe that’s 1/4lb of meat per serving.